Preparations marks a definite evolution of the glitch-driven hip-hop we've come to expect from Scott Herren, featuring productions laced with strings, elaborate jazz-flavoured arrangements, and of course the requisite supply of chop-and-change bitcrushed drums. After the all-too familiar start provided by a brief intro track and 'Beaten Thursdays', further down the line the vastly more interesting 'Prog Version Slowly Crushed' arrives as a musical feast condensed into five minutes, sporting some supremely wigged metallic flange as well as impressively inflated orchestrations. It's all very lavish, but for those after something a bit weirder, 'Aborted Hugs' with its staccato plucks and dissonant brass supplies ample quirk. There's a couple of great vocal tracks here too, the pick being 'The Class Of 73 Bells' which steers well clear of the sort of slice 'n' dice approach you might attribute to the Herren of old, instead just laying on a truckload of choral harmonic bliss. Sure, Preparations is no stylistic quantum leap, but nor does it actually need to be: as far as instrumental hip-hop goes, you'd be hard-pressed to find anything more intricate, meticulously assembled or more sonically adventurous than this. As if the album itself wasn't enough of a draw, both vinyl and CD editions come complete with a bonus CD, Interregnums, drawing together the instrumental and orchestral source material that shapes the bedrock of Preparations. 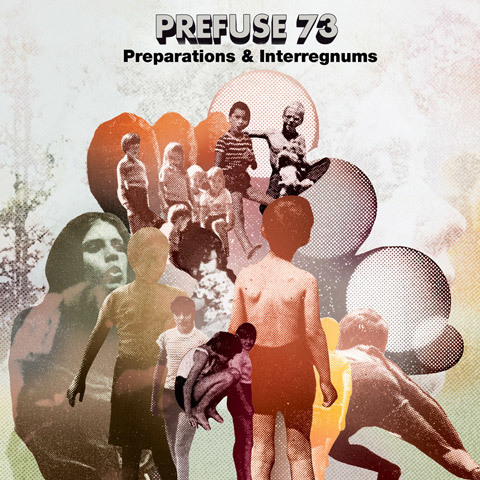 In this format the music comes without beats - in some cases remaining untouched by any major electronic treatments, essentially leaving you with a second, very different Prefuse 73 album to contend with.